automation of devices, obtaining data and for communication. like touch screen, pc, iPhone and iPod touch, mobile devices, etc. Magiesta is a server solution intended for control of home automation, automation of devices, obtaining data and for communication. It is intended to network the overall home and to provide different features via different devices like a touch screen, pc, iPhone and iPod touch, mobile devices, etc. Integrated and simple access to email accounts is available via Magiesta: your POP3 and IMAP4 accounts are going to be observed upon your request. Emails are displayed in a clear and comprehensive form organised in a way to provide fast access to information. 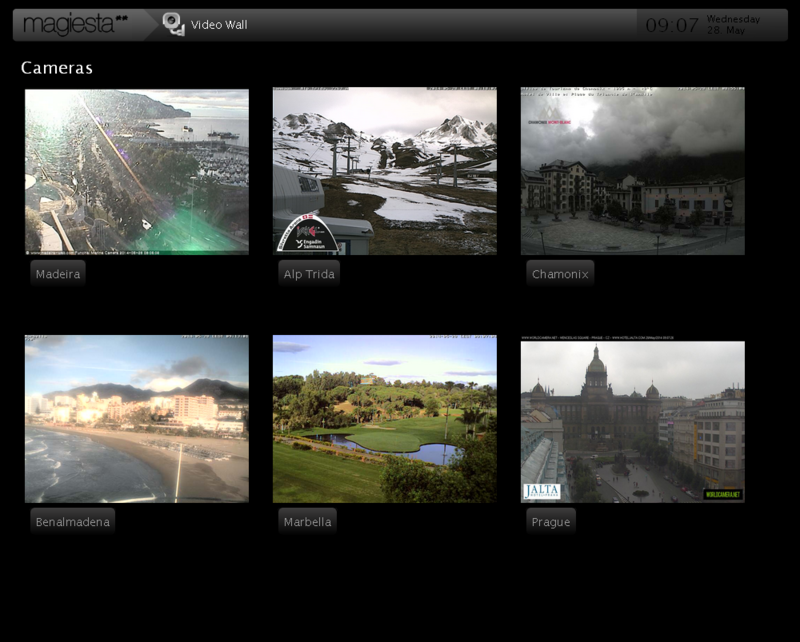 Magiesta provides the possibility of a number of different video sources to be configured. By adding an IP address of the camera and credentials (if needed), you can add another monitoring point and thus increase the level of security. The Video wall shows all available sources in a preview screen, and you can select one to be displayed in full screen mode. This provides a descriptive way to have all the sources in a scope, but also the possibility to focus on the most important one currently. Simply add your places of interest and track weather conditions as well as the forecast for upcoming days… and no more surprises! Just pack your bags and go for an adventure! 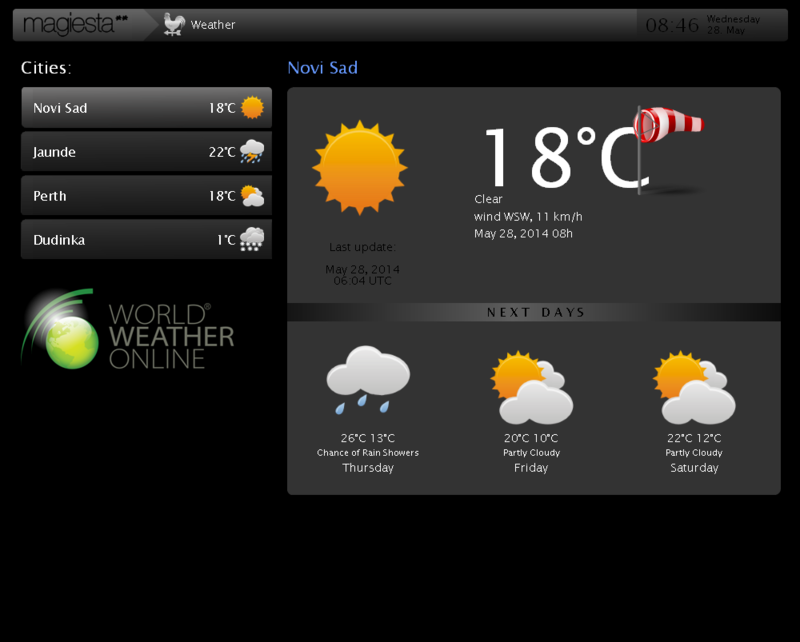 The Weather module provides the information about present weather conditions as well as for the upcoming 3 days. Simultaneously, you can track up to 5 locations worldwide and have them in focus. According to your current activities or mood, lights, shutters, audio, video and other devices are going to be adjusted to follow you in each step. Just one touch of Magiesta will turn your home into a cinema, opera or crazy discotheque. Or in something more fantastic! 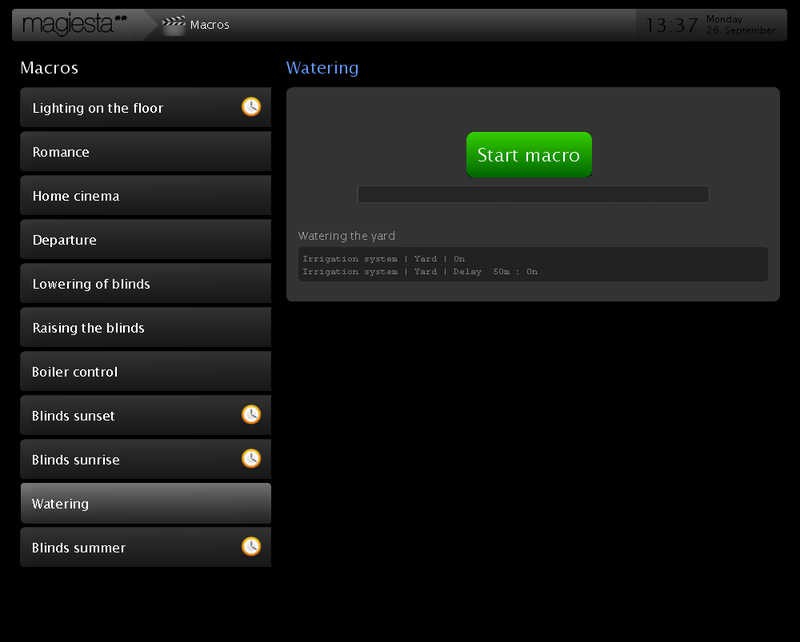 Magiesta includes the support for reading and displaying RSS feeds. 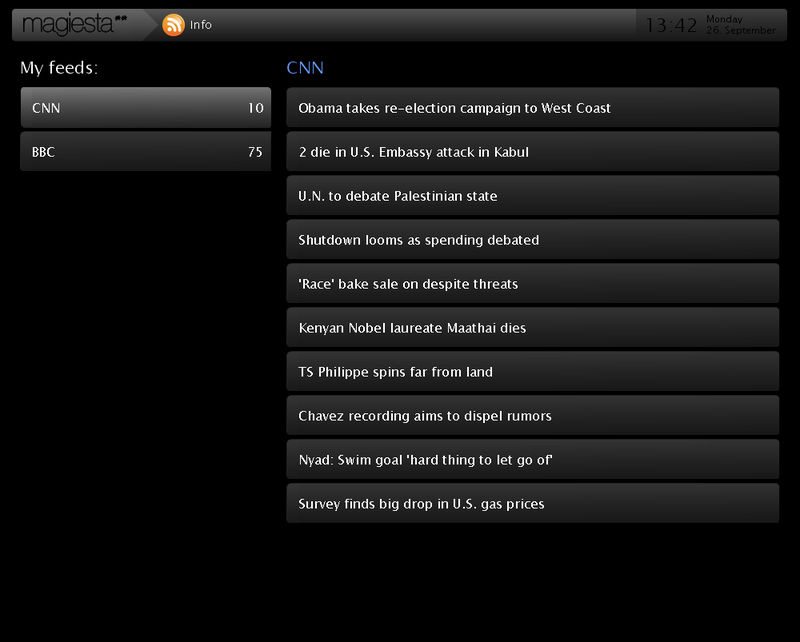 Just add your favourite feed channel and enjoy fresh news each time you approach the application. 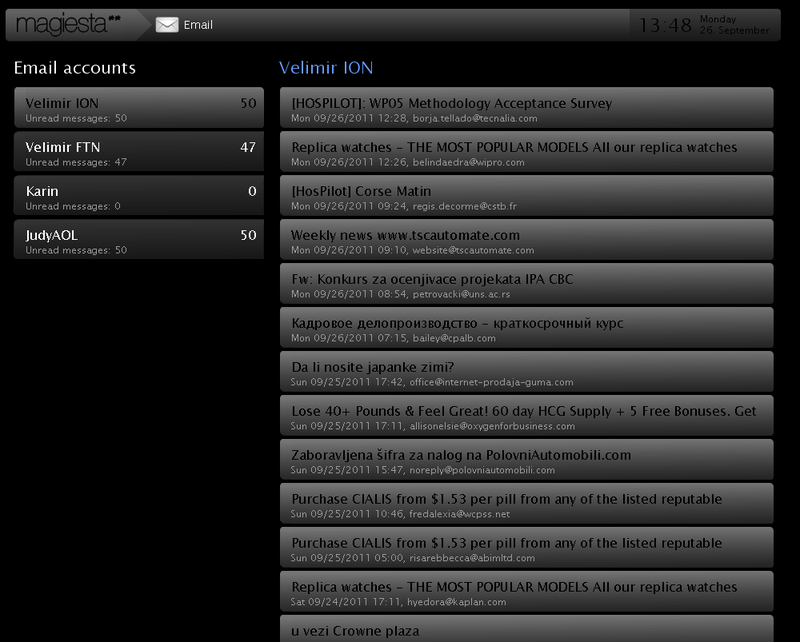 You can add any number of different feeds and have them accessible in a fast way. Magiesta supports all the most popular and widely used RSS formats and can display the content. 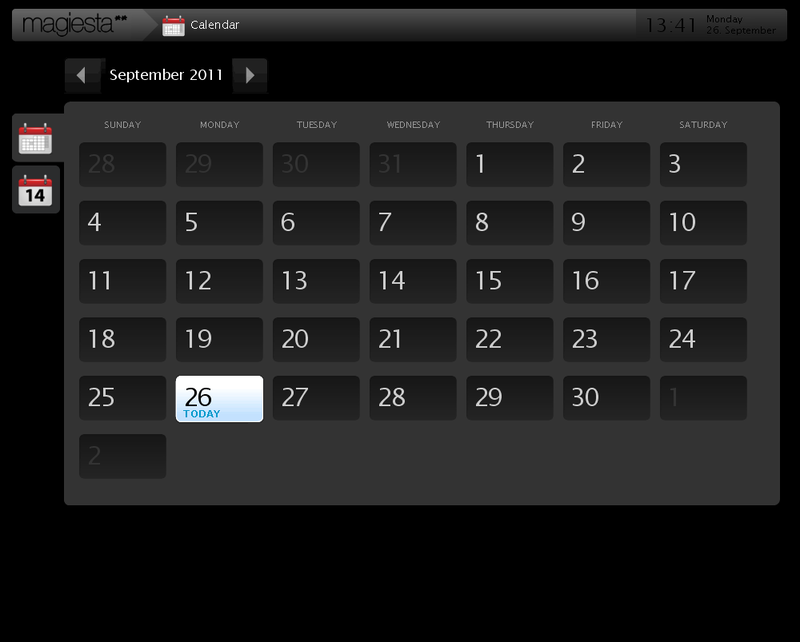 Magiesta offers an integrated calendar functionality with the possibility to add events and receive notification on the first screen. Track anniversaries, birthdays, important dates, car repair schedule and other dates and never miss an event again. 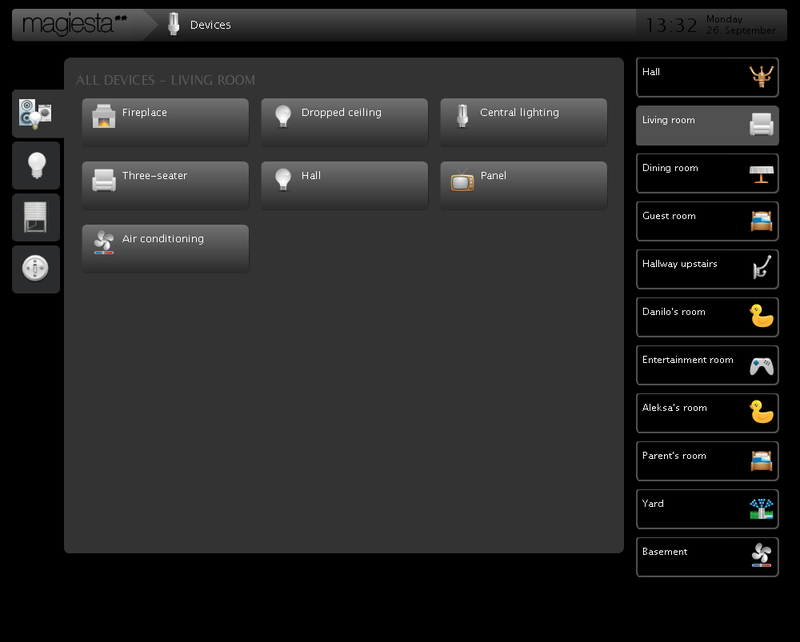 Consider Magiesta as a central information panel in your home. Just check it in the morning and have a notification of all the important events – who wants to forget the wife's birthday! Magiesta provides an interface for easy configuration of all the features without usage of a pc or laptop. All the information can be entered using a simple and intuitive visual interface, without the need for user to have an extended knowledge of programming.